Insights from personal observations and interactions with two ethnic communities in Sekong province. Sekong Province, Lao People’s Democratic Republic – Early in the morning, our team traveled to Sekong province. With less than 100,000 residents, Sekong is the second smallest province in Lao. It is also one of the poorest. Sekong province is located in one of the most remote areas in Lao: most of the province’s 42 villages are inaccessible by road because the infrastructure has been poorly developed. Our mission was to pre-test communication campaign concepts, materials, and messages for the Lao government’s sanitation program among representative audiences in two rural communities. 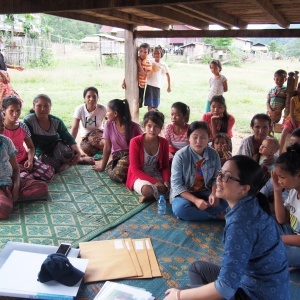 The district coordinator of the Center of Information and Education for Health (CIEH) arranged for our group to meet villagers of Toungkeo in the Lamam district. Lamam, which means “lowland plain,” is one of the four districts in the province. The ferry we took en route to Ban Tok Ong Keo. From the ferry station, we drove through rugged terrain and winding mountain slopes. We passed by three small streams that indicated the richness of the water reservoir further up in the hills. It was almost midday when we finally reached Ban Tok Ong Keo. Four staff of the village health center greeted us and joined us for a quick packed lunch. A typical house in Ban Tok Ong Keo. Nestled in between the undulating mountain slopes, the village was covered by lush vegetation following the recent rains. The air was hot and humid. We noted electrical posts in the village, but none of the houses were connected to the main lines. There was no mobile signal and our phones did not work. Considering the distance we traveled, I could imagine how tedious and expensive it would be for latrine sales agents or businessmen to travel here with their latrine products and supplies. Sales agents never reached this village. Sekong province is ethnically diverse. There are 14 ethnic minority groups, and only three percent of the population is Lao Loum. While the government verbally recognizes the use of ethnic languages, it officially encourages people to read and write only in ethnic Lao Loum. These villagers belong to the Alak ethnic minority, which reportedly constitutes 21 percent of the province’s population. The government categorically includes them among the “Lao Theung” ethnic group, the “mid-slope Lao.” The Alak women are known for weaving unique and high quality Lao “sin” (skirts). Women participants in Ban Tok Ong Keo. A group of 12 women was assembled to meet us in one of the houses. The field coordinators explained that people are shy about talking to foreigners, so we did not ask for their names out of respect for cultural sensitivity. Instead, we noted their ages and education levels. We asked the most senior woman her age. She said, “I [am] maybe between 50 to 60 years old.” She could not remember her birthday. This is common among Laotians; people do not always know their birthdays and in practice, a majority do not celebrate birthdays. When asked about the names of her 19 children, she could not remember them all. But she claimed that all 19 children and her grandchildren from her three married daughters are living with her in one house. Most of the women pre-test participants spoke limited Lao language. Only three women could read Lao characters. These women reported that they had reached fourth grade in the primary school before leaving school. The rest of the women had reached only the second grade. The government built their houses. This could explain why the majority of the houses had similar architecture. One elderly male neighbor said, “A few years ago, the government resettled us to our present location. We used to stay in a much lower ground along the river. But every time it rained, the river overflowed. We experienced flooding.” As a result, the government built their houses in higher plains and provided gravity-fed water to a cluster of households. The government also built a latrine for every family. But as the number of families grew over the years, others did not build more toilets. Older villagers in particular reverted to open defecation. In the neighboring village of Ban Nava Kang, we met eight Alak women. None of them had attended school. They could speak very limited Lao, but could not read Lao characters. Two of the older women were asked of their age. Like the older woman in Ban Tok Ong Keo, they could not also tell us their real ages and birthdays. Households in this village do not have latrines. We were informed that everyone goes to the open field to defecate. This observation was validated by our pre-test materials. Men studying our initial communication materials. Among the four communities where we tested the proposed campaign concepts, messages and materials, the responses of villagers from Ban Tok Ong Keo and Ban Nava Kang led us to believe that open defecation is strongly related to factors specific to the culture of groups that practice it. The Alak villagers we met have particular ways of thinking about latrines, and they reacted to situations or events as they understood them. It is a hassle to collect water before defecating. The water source is too far from their houses. They would need to carry a lot of water because they have to clean the latrine after using it. If they do not clean it, it will smell bad because it is near their house. They prefer to defecate in the open because they can do so easily. Feces will dry up quickly outside in the heat, rather than in a confined and unpleasant-smelling toilet. They worry that neighbors will notice them walking to use the toilet. They prefer the privacy offered by defecating in the bush instead of at home. The Alak men agreed that latrines would help ensure their daughters’ safety, but the current structure of their toilets does not offer privacy. The Alak women of Ban Nava Kang told us that our visual showing the girl who feels the need to relieve herself was a woman who feels the pain of giving birth. After further probing, one of the women associated the girl’s stomach ache with “diarrhea” from eating unclean food. These two Alak communities showed us that having a latrine was not among competing priorities of their daily needs. The open field where they defecated was seen as more convenient than a latrine. The open field was big, unlike the very small, closed, and hot latrines. Open defecation has been part of their culture. It is a behavior that they have acquired over time. Hence, these communities could be resistant to changing their sanitation practices. They may choose to stop open defection, but it may take time. The environmental conditions surrounding these villages further shaped their attitudes in favor of open defecation. In Ban Tok Ong Keo, the geophysical conditions of the village make latrine construction difficult. The soil can be too hard, and the ground water is sometimes too low. Thus, villagers were not motivated to construct new latrines. This pre-test experience taught us valuable lessons about our communication approach to change sanitation practices among ethno-linguistic populations. It led us to strengthen the effectiveness of our approach by making it adaptive to specific local contexts. Identifying and building the capacity for trusted sources of information in the community.